** Introducing the Doctor’s NEW SONIC SCREWDRIVER! 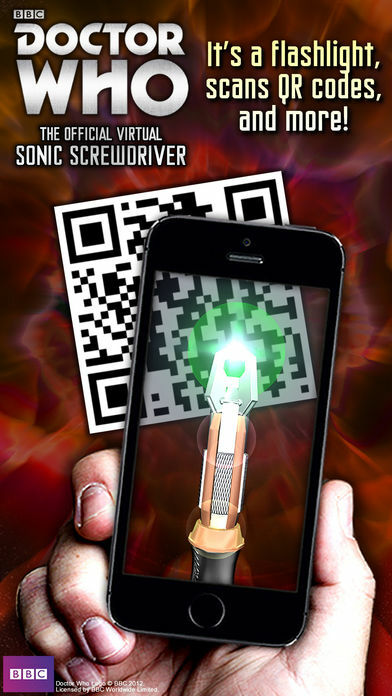 Turn your iDevice into ELEVEN different Sonic Screwdrivers with the Official Doctor Who Virtual Sonic Screwdriver app! 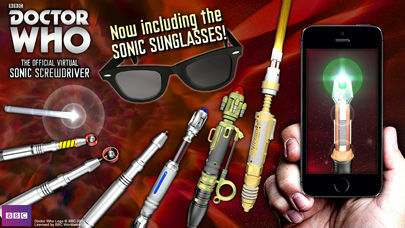 v2.1.1 adds THE TWELFTH DOCTOR’S SONIC SUNGLASSES! v2.0 adds THE MASTER’S LASER SCREWDRIVER! Shake to extend and tap to fire lasers! 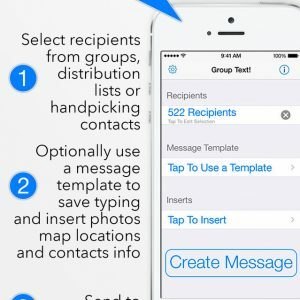 You can also now scan QR CODES and more! Celebrate the return of the longest running science fiction TV series in the world, Doctor Who, in sonic style with detailed graphics, authentic sound effects, an augmented reality background option, and so much more. It’s like you’re using a real Sonic Screwdriver, not your iPhone! So grab your fez and bow tie (bow ties are cool! ), and don’t leave your TARDIS without it! – Detailed 3D models of 11 of the Doctor’s Sonic Screwdrivers, each with their own unique details and features! 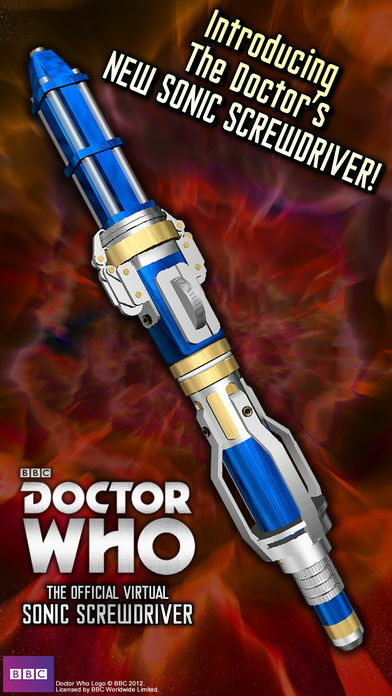 Whether you’ve been a fan for 50 years, or only 5, there’s a Sonic Screwdriver for you! — The Twelfth Doctor’s NEW SONIC SCREWDRIVER! — The Twelfth Doctor’s SONIC SUNGLASSES! – Two background options: The transparent background makes it look like you’re holding a real Sonic Screwdriver, not your iPhone, or you can explore the cosmos with the detailed deep space backgrounds! The Second Doctor’s Sonic Screwdriver even turns everything Black & White! 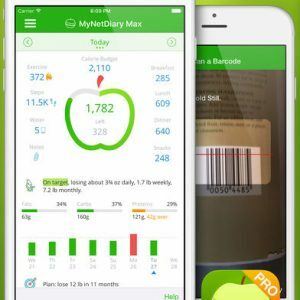 – Scan QR CODES, BARCODES and more! – Authentic sounds from the TV show for each and every action! Each Sonic Screwdriver is different. 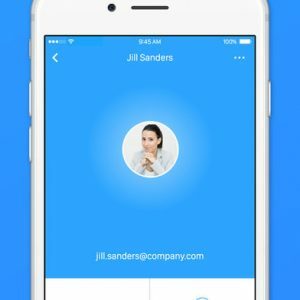 – Simple point and think controls! Touch the screen to activate, and slide your finger up and down to change the pitch of the sound. – Tilt and movement controls! Activate the Sonic Screwdriver and tilt your iPhone to change the pitch. You can even shake the 11th/12th Doctor’s Sonic Screwdriver to extend it, just like the Doctor does! 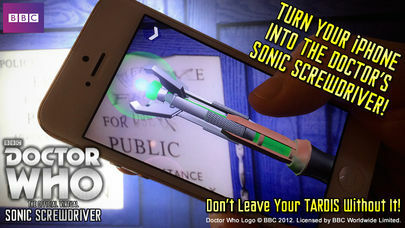 – Different zoom and angle settings: See the details up close, or see the whole Sonic Screwdriver on the screen at once! 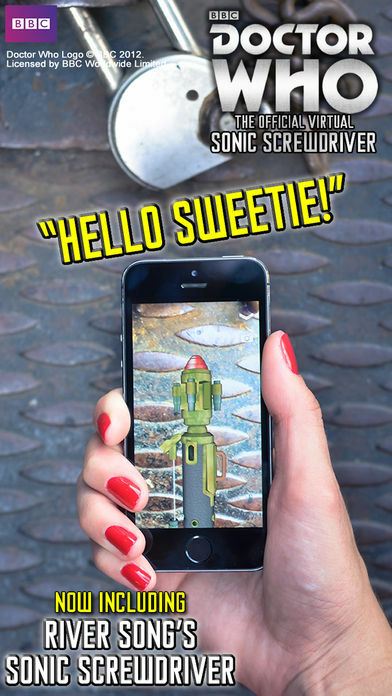 – The Sonic Screwdriver controls your iPhone’s flash, making this the coolest flashlight app in the galaxy! The Doctor uses his Sonic Screwdriver to unlock doors and hack computer systems! He defeats Daleks, and scares Cybermen! He scans the shadows for Vashta Nerada, and lights the way to whole new worlds! He saves the universe every day with his trusty Sonic Screwdriver in his pocket! What will you use your Virtual Sonic Screwdriver for? Simply point and think! Your imagination is the limit! * Remember, it doesn’t work on wood. BBC, DOCTOR WHO, TARDIS, DALEKS and CYBERMEN are Trademarks of the British Broadcasting Company and are used under license.